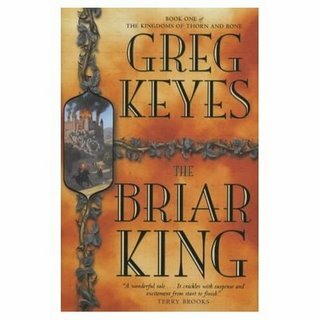 The Briar King by Greg Keyes is the first book of the fantasy series Kingdoms of Thorn and Bone. The plot elements are the usual fantasy fare: the Briar King, a legend from children's tales and folklore, is waking from his slumber and threatening the kingdom (and ultimately the entire world). The host of characters includes but is not limited to a headstrong princess, a quiet but courageous woodsman, and a dedicated priest. If I had to sum up this book quickly, I would say "good but not great". The story reminds me of a host of other books: Game of Thrones, Jim Butcher's Codex Alera series, and Robert Jordan's Wheel of Time books. A fantasy story with a multi-perspective narrative combined with the end times has been done by many authors, and it really needs to be extraordinary if it's going to stand out. While Keyes does a great job with world building, there is no rhythm to the flow of the narrative. Sometimes you may hear from one character for a single chapter and never get their perspective again. It jumps around too much. A major new character is even introduced in the last third of the novel--but by then I didn't really care, I just wanted to hear from the few well-established characters. I enjoyed this book enough that I plan to eventually pick up the second one in the series. But I'm not in any rush.